Music Box of Horrors Tickets Giveaway…THE WINNERS! Thanks to everyone that submitted their answer for our little trivia question. The answer was in fact the 1973 film The Legend of Blood Castle, also known as Ceremonia Sangrienta, Blood Castle, Bloody Countess, The Female Butcher, and a few more titles. Grau made this film right before making his version of a zombie film, Let Sleeping Corprses Lie, which also has a variety of AKA’s. Here’ the trailer Grau’s take on the famous Hungarian Countess. But let’s get to why you’re here….the winner. A Bloody Congraduations (as well as 1 free ticket) goes to Aaron Christensen, Jerry Downing, Christopher Sobczak, and Kristin Wicks. Your name will be given to the Music Box where you will be have a ticket waiting for you when you get there. Looking forward to spending 24 hours of maddening movies with you! Happy Monday Everyone! Another Monday, another Mystery Photo. But before we get to today’s mystery pic, let’s talk about the one from last week. The shot is from the 1995 movie Habit, written, directed, AND starring Larry Fessenden. Now I know there might be a few of you out there that are tired to death of vampire films, but this one is different. Traditional in its approach, but different in the same aspect. I couldn’t recommend this film enough. And lucky for you, this is one of the films that is included in the Larry Fessenden Collection coming out from Shout Factory on October 20th. Make sure you check it out. Congrats to the following scholars for identifying the correct movie: Hoby Abernathy, Aaron Christensen, & John Pata. Now…on to this week’s business…our lastest photo. So take a good look, scratch your head and then send us your answer to jon@kitleyskrypt.com. Good Luck! Music Box of Horrors Free Ticket Trivia! Okay folks…are you in the Chicagoland area? Or if not, are you still wanting to attend this year’s Music Box of Horrors, held at the Music Box Theatre in Chicago from noon on October 24th to noon on the 25th? For updates on this event, head over to their official page HERE. Well, if you are one of these people, then here is how you can win a free ticket to this event. Below is one simple trivia question. All you need to do is email the answer to me, at jon@kitleyskrypt.com. Then this Tuesday, I will draw 4 names from all the correct entries and announce them here. Ready? There are four films listed so far for this year’s 24-hour marathon. One of the directors of these four films also made a film loosely based on the famous Elizabeth Bathory, the Hungarian noblewoman who was said to have killed upward to 650 young girls to bath in their blood. What is the name of the director and the name of the film? For those who didn’t know, the Music Box of Horrors returns this year on October 24th for another 24-hours of movies, mayhem and madness. They have only announced a few titles so far, more recently the addition of Jorge Grau’s Living Dead at the Manchester Morgue (aka Let Sleeping Corpses Lie, amongst about a dozen other titles). Needless to say, I was very excited to hear that, since this is one of my favorite European zombie films. 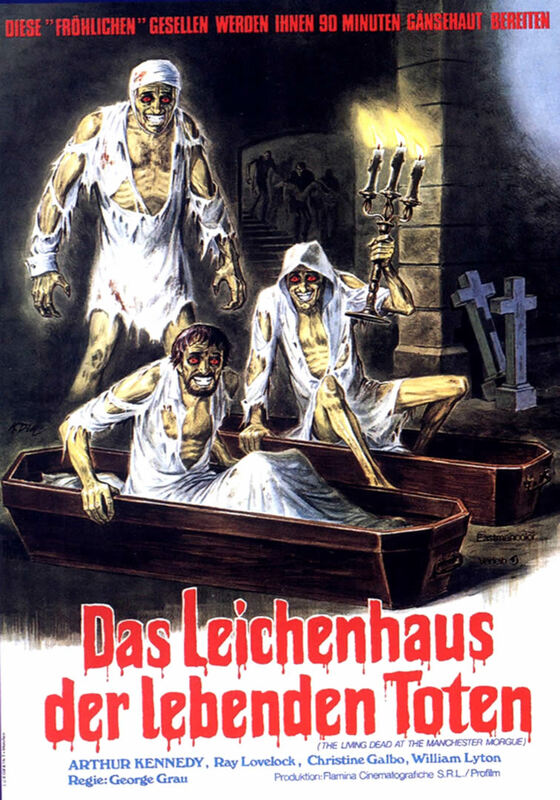 Made only a few years after Romero’s Night of the Living Dead, and amazing gore effects by Italian mastro Giannetto De Rossi (Zombie, The Beyond, House by the Cemetery), Grau gave us something that was slightly different in the zombie mythology, with a little bit of a enviromental message, and one hoot of a undead flick. If you haven’t seen this, then now is your chance to not only see it, but see it on the big screen! The Krypt will be vending once again this year, so we’ll have our usual wares of horror reference books for you to help with your horror education. Tickets for this onslaught of horror are only $25 if you purchase them before October 1st. Between the 1st and Oct. 23rd, the tickets will be $30, and then $35 at the day of the show. So you should really order your tickets now and save that extra little bit of cash. Since we just posted our review of Troy Howarth’s earlier book, so what better time then to make mention that his newest book is now out and ready for you to order your copy for your own collection. There are two different versions of the book, so depending on your taste and how much money you want to spend, it is up to you to decide. There will be the standard edition, where the photos will all be in black in white. But there is also a full color version, which will show off the glorious color from the stills, posters, and everything else. Obviously, I would recommend that version. But in a rare case, it will actually be cheaper to order the book directly from the publisher than getting it from Amazon! I know that seems impossible, but check it out. For the standard black and white edition, you can get it from Amazon for $27. But if you go to Midnight Marquee, this normally $30 price tag has a special sale price of only $18! For those who really want all the glorious color photos, then instead of paying $67.50 on Amazon, you can get these from Midnight Marquee for only $45, which is $25 off their normal price of $70. So show these small press publishers that they matter and take the time and effort and order directly from them instead of going through Amazon. Everybody wins here! Published by Midnight Marquee, 2015. 233 pages. Italian giallo films are something that most horror fans are somewhat familiar with. I mean, it’s pretty hard to be a horror fan and not have some familiarity with directors like Dario Argento and Mario Bava, and their work in the dark, mysterious, and violent thriller sub-genre called giallos. Even if you might not be a fan of them, you at least know about them. If you are a fan of this strange sub-genre, then you know there is a serious amount of ground to cover. That is where Troy Howarth’s book comes in as handy as black leather gloves and a bottle of J&B. One of the things I loved most about this book was the history lesson. Sure, I’ve been a horror fan most of my life, but this book just shows you that there is always room to learn more. Even before we get to the actual reviews, we get several chapters of a history lesson that I think should be required reading for any horror fan that has an interests in Italian films, as well as those interested in giallos. With a ton of information, writer Roberto Curti gives us a great history lesson on when and where this giallo genre actually started, and from where they came from. There was a lot of information that I wasn’t even aware of. Our last photo was from the classic sci-fi horror flick I Married A Monster from Outer Space, which I have to say is probably one of the best exploitation titles out there. With a title that tells you right up front what kind of feature you are going to see, you know you won’t be disappointed. So much fun here, folks. And it looks like a few of you out there remembered this shot and sent in the correct answer. They were: Aaron Christensen, Bill Harrison, Doug Lamoreux, Charlie Miller, and Michael Shields. Nice job! So let us get to this week’s photo. Sure, we might have used another shot from this movie a year or so ago, but there is a method to my madness, as they say. So take a ponder at this poor fellow sitting there in his birthday suit and see if you can recognize which film this is from. Good luck.